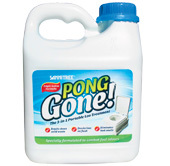 Used for the maintenance of portaloos in caravans and on yachts, Pong GoneTM is a triple action formula that deodorizes on flush, breaks down solid waste, and eliminates stinky portaloo smells. 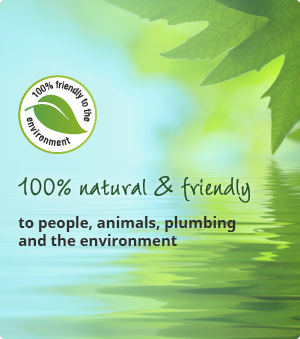 It is 100% environment friendly. Pong GoneTM is applied to the top tank of portable toilets. As the unit is flushed it releases a pleasant smell as it flows to the receiving tank. Here the sulphur retardant goes to action to reduce the malodours associated with decomposition. Our powerful, active bio-enzymes then work to liquefy the solid waste. Single application formula is very easy to use. Yacht and caravan portaloos are notoriously stinky and unpleasant to visit. Pong GoneTM will leaves your portaloo area hygienically fresh and free of smelly odours. Quickly works to liquefy solid waste and prevent foul-smelling tank blockages. Contains no Phenols or Phophates and is completely harmless to the environment. Portable toilets usually comprise of two sections: a 20 litre upper tank and a 20 litre receiving tank. Pour 200ml of Pong GoneTM into the top tank (or follow a dilution ratio of 100/1). As the unit is flushed it will release a pleasant smell as it flows to the receiving tank where the sulphur retardant will reduce malodours from decomposition. Pour Pong GoneTM into holding tank at a dilution rate of 100/1. Determine capacity of holding tank, e.g. if tank holds 200 litres pour in 2 litres of Pong Gone and add 10 litres of water to cover base of tank. A clear liquid, free of Phosphates and Phenols. Contains Amalases, Proteases, Lipases and Perfume. 12 months. Keep in a cool, dry place out of sunlight. Our product is specifically formulated to remove sweaty odours from sports fabric and is 100% natural, organic and biodegradable. Save water and say goodbye to urine smells in your loo! For more info, please call SA: +27 21 701 1266 / Int: +27 21 788 3759 or email us below. Your privacy is important to us and we will never share your information with anyone.